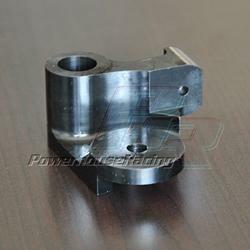 The OEM timing belt tensioner brackets are prone to cracking and breakage in high RPM/high HP applications. These CNC machined billet tensioner brackets are CAD plated and heat treated and can withstand anything the timing belt can throw at it! PHR’s tensioner bracket ALSO has a pressed in bushing for where the plunger meets its mating surface.